Newton's Nook Designs: August Release - Preview! Today I'm sharing a two cards previewing our releases this month Prehistoric Pals and Wagon of Wishes! Our first release for August is Prehistoric Pals - For some reason, as an adult I've decided I really like dinosaurs. I was never really that into them as a kid but now that I'm older they fascinate me. I love going to the museum and seeing all the cool dino bones. They must have been amazing creatures. But this set is really about cute Dinos -- not sure if there really is such a thing but that's half the fun of drawing - creating what you imagine things to be! I'm hoping that these dinos will make you smile! 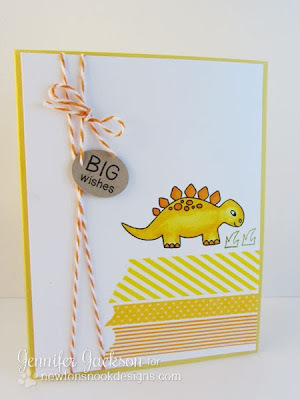 Here's a card I made using the Prehistoric Pals set - Check back tomorrow (Wednesday) to see the rest of the dino crew with projects made by our Design Team! Includes 14 stamps: 11 images and 3 sentiments. For me fall is all about trips to the orchard and the pumpkin patch. It's about picking apples right from the tree and making a pie with them that same day (best pie ever)! It's about Fall color and going for drives to see the leaves on the trees. That's what I was trying to capture in this set - wagons full of Fall fun and memories! 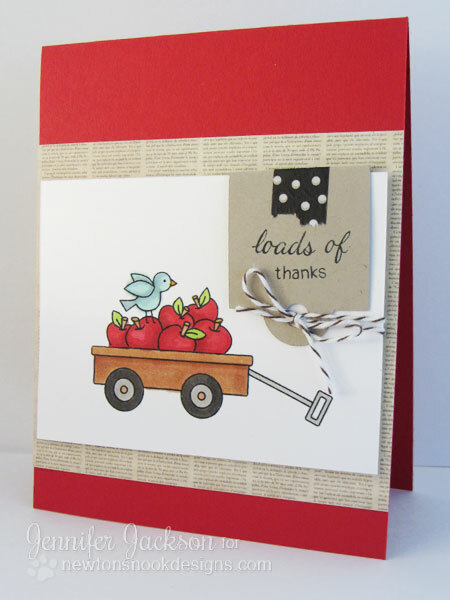 Here's a card made using this set - check back on Thursday to see all the images -in case you didn't guess it yet from my description - there will be different things to fill in the wagon with! How fun is that? Includes 11 stamps: 6 images and 5 sentiments. We will be revealing the full art for Prehistoric Pals tomorrow (Wednesday) and Wagon of Wishes on Thursday. Plus - our Design Team will be here for the next two days awesome projects made using them on both days! You are going to LOVE what they created! Then, both sets will be for sale in our shop at newtonsnookdesigns.com on Friday! Very cute...I totally understand about the interest later in life about dinos...not sure why I like them now and didn't even think of them as a child. It could be that I have 2 boys. Love the wagon of apples. Very cute. These are so pretty (can you call a dinosaur pretty? or do they get offended?) I can't wait to see what the team has to show. nice cards!! looks like awesome projects! Just wanted to say--your cards are adorable! These cards are awesome! I was just wishing the other day that I had a dinosaur stamp set. I was making birthday cards. But I would really love that wagon set. Can't wait to see all of the images.